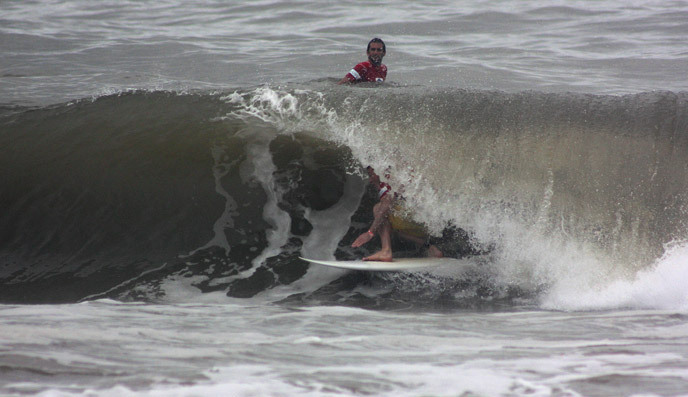 After eight straight days of torrential rain and stormy weather that caused a National State of Emergency in El Salvador, the sun finally came out for the Opening Ceremony and Day 1 of the historic El Salvador ISA World Masters Surfing Championship. A record-breaking 124 surfers from 21 countries, together with their coaches, managers and fans, filled the beach at Punta Roca with the colors of their national flags. The Sands of the World Ceremony officially opened the competition. At the traditional ceremony, representatives from every National Team brought sand from their country’s beaches up to the stage, where it was mixed together in a glass bowl. The perennial ritual signifies the union of nations, beliefs and races through surfing and the Olympic spirit this event embraces. Other dignitaries present at the ceremony were the Mayor of La Libertad, Carlos Molina, the representative of the Minister of Tourism, Roberto Edmundo Viera, ISA Vice-Presidents Karín Sierralta and Debbie Beacham, El Salvador Surfing Federation President, Saburo Okuzawa, and Gray Line AVI Tours’ Carlos Ortiz. 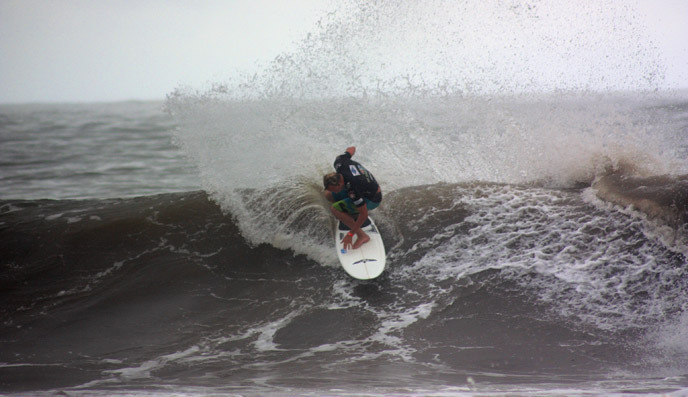 Immediately after Sierralta called the championship officially open, the event started at Punta Roca, known to surfers worldwide as the “Jeffreys Bay” of Central America, a reference to one of the surfing meccas in the world in South Africa. The waves were much better than during the days before, glassy and barreling, reaching 5 feet on the sets. A total of 20 heats were held with the Masters, Kahunas and Women Masters competing today. The best single-wave score of the division was earned by former ASP World Tour standout, Toby Martin (AUS). The Aussie was awarded with an 8.17 from the judges after exploding in a series of top to bottom radical turns. Other standouts in the Masters division were Davey Gonsalves (HAW), Gustavo Betancourt (PUR), Sean Mattisson (USA), Andrés Fernández (ECU), Jojó de Olivença (BRA) and Ross Williams (HAW). Women Masters (+35) followed in the schedule and had seven-time ASP World Champion Layne Beachley delivering the best performance of the day, reaching 14.50 (7.17 + 7.33). In the Kahunas division, the Australian Dean Shaw was the great standout. He won his heat, leaving three-time ASP World Champion Tom Curren (USA) in second after scoring a combined total of 12.66. On his best wave, a 6.83, Shaw came out of a long barrel and finished with a good set of turns. David Malherbe (RSA), Juan Carlos Angola (VEN), Jim Hogan (USA) and Ricardo Villanueva (PUR) were other standouts in the +45 division.